You are here: Home / In the News / Defiant Toddler? Call Elmo! While doing my regular surfing of Google News, I discovered an app. I love a good toddler iPhone app, and keep Norton’s iPod Touch filled with learning games. And the headline mentioned Elmo. 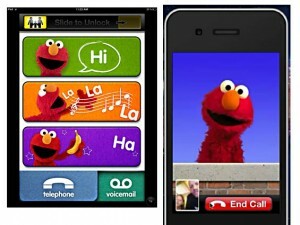 A good toddler iPhone app featuring Elmo is even better. An app designed for gaining the cooperation of a defiant toddler sounds like gold. If you’re running into sticky points with a defiant toddler, like a refusal to eat veggies or use the potty, a “phone call” or some FaceTime (okay, not exactly, but “video chat”) with the furry little red monster might help. Sort of. Got a parenting problem? Call Elmo! But then on the other hand…. I’m a really huge believer in responsibility. Personal responsibility is crucial and something that we have a responsibility as parents to teach. If I rely on a furry little red monster to get Norton to eat his veggies and not kick me in the face when we’re changing his diaper (or, better yet, get him to use the potty so we can ditch the diapers and the wretched diaper changes that accompany them altogether), aren’t I abdicating my parenting responsibility? Am I not instead casting the furry little muppet in the role of parent instead of myself? I’m not sure what I think about this. Maybe, if used responsibly, it can be like the awesome neighbor or the cool aunt garnering some extra cooperation. Perhaps it could be just another tool in my parenting arsenal. Maybe it’s no different than having Norton watch Elmo’s Potty Time eleventy billion times so that he’ll like the potty better. Or maybe it’s just a big fail. What do you think? Would you let Elmo (and possibly your smartphone) help you get your defiant toddler to be a bit more cooperative?